I went with South African Chenin Blanc (medium-dry ), bought for £5.50 from Tesco. Medium-dry, not a medium-sweet Chenin Blanc, because I remember this worked well as a substitution when I visited Breddos Tacos. So thought I will test my luck one more time. So, about the food. By now I have already tried a truck load of interesting stuff on streets of London, and this is another one, being a fusion cuisine where Korean meets Tex-Mex. It may seem a bit bold to cross these to culinary styles, but if you are looking for a hearty burrito with a twist, you won’t be disappointed. Hearty is the key word here, because you get a lot to chew on with a plethora of aromas to savour. In these circumstances, the wine is just a background. An interlude, helping to refresh your palate. 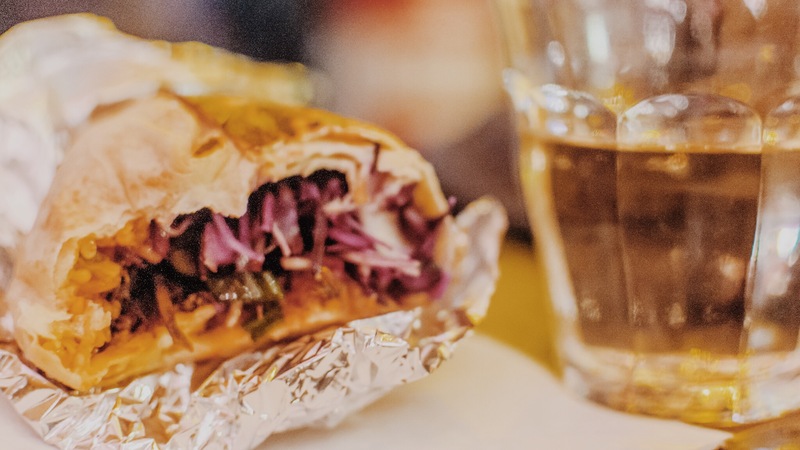 An inexpensive medium-dry Chenin Blanc plays that role well, having all the right aromas to form a strong aromatic bridge with our Korean burrito, and just enough crispness to prepare your senses for next bite. Plain, simple, and reliable pairing.